Last night I spoke and voted in favour of Zac Goldsmith’s amendment to the Recall Bill. We need real recall that will give real power to voters. The government bill is not that. It is a deep shame that the amendment didn’t pass, a majority of MPs in all parties voted it down. But this is not the end and we will continue to push for these important powers to be handed to our constituents. 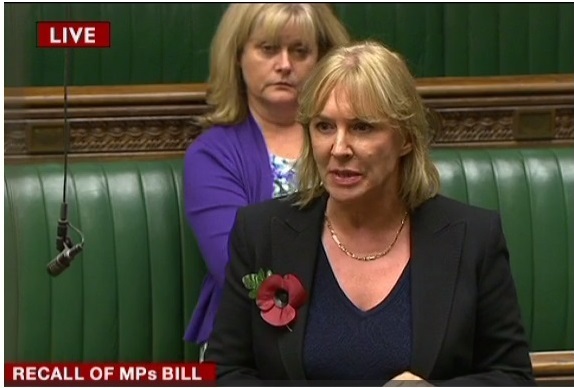 Nadine Dorries (Mid Bedfordshire) (Con): I speak to the amendments as someone who is accustomed to being in the eye of a political storm. I am possibly the only MP in the Chamber who has had an attempt at recall mounted against them. When my hon. Friend the Member for Richmond Park (Zac Goldsmith) first tabled the amendments, he asked me to speak about my own experience. At the time I decided not to do so, because I did not think it was particularly appropriate. But having heard some of the hot air in the Chamber tonight, I feel compelled to use my own example, and its consequences, to lay some of those bogus arguments to rest. Two years ago today, I took part in a reality TV programme called “I’m a Celebrity…Get Me Out of Here” and I disappeared to Australia. The hon. Member for North Durham (Mr Jones) asked what would happen if a local or national newspaper ran a campaign against an MP, but I had every national newspaper against me and not just for a day but for a month—in my study they stand waist high. Of course, none of those newspapers said that Parliament was in recess. None of them said that I did not miss any Government legislation. None of them said that I had spent every day of the summer in my constituency office and the trip was my holiday. There were even Members who joined in the outcry against me, giving comments to the newspapers from their sun loungers from Barbados to Benidorm. Nobody said, “Oh, by the way, we are in recess”, and a massive media storm ensued. Even my local radio station, BBC Three Counties, went to my constituency and vox-popped constituents. It did not take comments from constituents who were backing me—it refused to do so. The national media created a perfect storm and rode on the crest of it for an entire month, giving them thousands of column inches. My constituents did not sign that petition because they know the kind of MP that I am. I am not a party-political MP. When I am in my constituency I am not a Conservative MP—I represent everybody, regardless of what political party they vote for, and my constituents know that. They also know that I will go the extra mile. I do not do surgeries once a month—most times I do them every week. My constituents know that I will go the extra mile for them. They know that I do not get involved in grubby political games in Parliament. They know that I represent them. I put my constituency before my party, and I put my constituents before Westminster. I have always done that- My constituents know exactly what type of MP I am. There has been an elephant sat inside—not outside—the Chamber tonight, and it is the reason why the Government have introduced the Bill. They have not introduced it because the public have infinite trust in us, or because they think MPs are wonderful people that work hard for their constituents. The Bill has been introduced because the people do not trust politicians any more. They have no faith in us. They need to know that they can have more democratic control over what we do here because they do not like a lot of what they see going on. I know that most MPs come here to work hard and look after their constituents, but the Whips Office holds the keys to power and ministerial ambition so there is a difference between the consideration that some MPs give to their constituents and what they give to their own political ambition and their climb up the greasy pole. The difference is as vast as that between sound and silence. Many MPs are one person in their constituencies and a different person entirely at Westminster. People are sick of the Whip system, the parliamentary system and the party-political system. They do not want to see that any more because they want people to represent them. They want their opinions represented here. They do not want grimy deals done such as, “Don’t defect to UKIP and I’ll make you a Minister” or “Don’t vote for this Bill because the Liberal Democrats don’t want you to.” They know about those deals and they are disgusted. That is why we have the Bill. The amendments could have been a little grittier, but it is vital that we vote for them. It has been argued tonight that Members could be removed for their position on a particular policy, but if they are good MPs that is nonsense. It has been argued that an MP could be removed because of a political row, but I am sure that all the 766 people who signed that petition were supporters of the Opposition. During the 2009 expenses crisis, one thing we knew was that everybody nationally hated MPs, but on a constituency basis many people said, “No, we don’t like MPs, but our MP is okay.” That is because they know what we do for them and the type of person we are. When MPs do fall down, it is because they ignore their constituents, do the grubby deals and put their own personal ambition above the interests of their constituency. A former Minister complained about the Bill today. I asked whether he would vote for it if he was still a Minister, and he said, “Of course I would.” That is the root of the problem—collective responsibility and putting party first. We need this Bill. I do not believe that we will have the benefit of the British public’s trust unless the Bill goes further and we vote through the amendments tabled by my hon. Friend the Member for Richmond Park. Any MP arguing that thousands of people, just because they are political opponents, would walk down to the town hall and put their names on a register to get them out because the local newspaper has a campaign against them, is talking absolute nonsense. Nobody has anything to fear. If you are a good MP, if you put your constituency first, if you are part of the people in your constituency, and if you take no notice of your Whips Office but do what you should do in principle and do what is right for the people who elected you, then you have nothing to fear from either the amendments or the Bill.